When my father was dying several years ago, I flew to Maine to help with his care and say goodbye. I arrived in late October, on a warm, fall day, and he was still eating and talking and trying to finish his last book, which I helped him edit those final days. When I left a week later on Halloween, winter had arrived with an icy blast and everything was covered in snow. He died two days later, on All Souls Day. Before I left, the only thing of his I asked to take was his bird clock, pictured above. It chimed with the call of a different bird each hour from the wall above his writing desk. Even though the birds are now all faded to pale gray, I’ve had it on my wall ever since. Until this week, that is…when it apparently led to the haunting of my house. 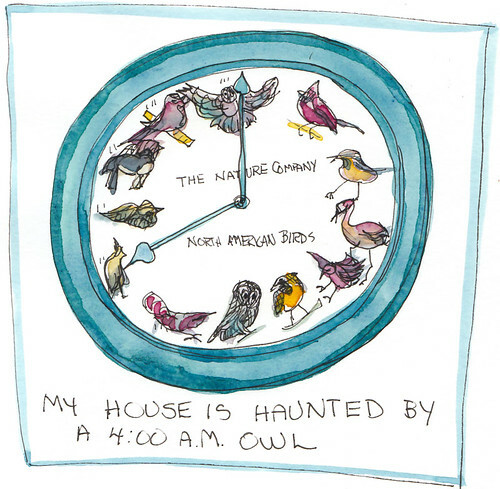 I never was able to get the proper birds to chime on their designated hour. The two owl calls were supposed to chime at 6 and 12 but when the hands pointed to the Oriole it played the call of an owl, and when it pointed to an owl you might hear a blue bird or a cardinal. But I digress…back to the haunting. A week ago, at exactly 4:00 a.m. I was awakened by the sound of the owl calling out from the clock: “Whooo whoo whoo. Whoo whoo whoo. Whoo whoo whoo.” The clock has a light sensor and is not supposed to chime in the dark, and had never done so before. I got out of bed and walked toward the clock in the dining room, but the sound stopped before I could reach it. The next day, groggy from disturbed sleep, I removed the batteries that control the bird calls. But the next morning at exactly 4:00 a.m. the same thing happened again. I removed the last battery. The clock stopped and I put it on a shelf in another room. The next morning at exactly 4:00 a.m.: “Whoo whoo whoo…etc.” I lay in bed wracking my brain trying to come up with what else could be making that sound but could think of nothing. That day I put the clock in my garage, which is down a long driveway from the house. The next morning, 4:00 a.m., the owl was back, singing away from my dining room, without need of clock or batteries. Now lest you think I live in a lovely forest surrounded by tall trees where owls and doves nest outside my bedroom window, I should explain that I live less than two blocks from a major highway, and there are no tall trees near enough for me to hear an owl call from them (should an owl be so foolish as to take up residence on my humble street). And if there was an owl (or even a mourning dove or pigeon) making those whooo’s, is it possible they would do it only at 4:00 a.m., and only in three rounds of three calls? I know next to nothing about birds, but this seems unlikely. I asked my neighbors if they have an alarm clock that rings at 4:00 with the sound of an owl, and looking at me strangely, they assured me they definitely did not. My friend Sharon who knows about these things, offered to bring over a sage smudging stick she’d bought from Native Americans in New Mexico. Last night we went through my house, waving the lovely scent of smoking sage through all the rooms, especially where the clock used to be. Then we gently invited the hauntingness to leave, along with the smoke wafting out the studio door. I tried to be optimistic but…. This morning at 4:00 a.m., it was owls again! I’ve gone through my entire house, looking for anything that could possibly make the sound but have found nothing and I never hear it any other time of day or night. At lunch yesterday I asked my co-workers for advice. Cyndy listened and then said, “Uh huh, Jana, so has anyone else heard these birds…. ?” and everyone laughed. Then Kate suggested I have a slumber party where everyone stays up until 4:00 a.m., and at 3:55, positions themselves around the house, ready to pinpoint the sound. I’m guessing I’d have very few positive RSVP’s for that invitation though. 1. Accept that my house is haunted and learn to sleep through it. 2. Start getting up at 4:00 a.m. every day and enjoy the quiet morning hours. I’m usually the most persistent and resourceful person I know, but I have to admit that this time I’m totally stumped. At this point, I’m open to any ideas or suggestions you, my kind reader, may have. Do you think it could really be a haunting? Do you think it could be a real bird (or other natural creature)? Help! 4/4/08 UPDATE! Mystery (partially) Solved! Despite all the wonderfully creative ideas posed in the comments section, tonight I found the culprit! I pushed EJECT on the DVD player connected to my TV to insert the disk that came with a new, good book “Mastering Composition” by Ian Roberts. Instead of the drawer opening it began making that sound “whoop, whoo whoo; whoop, whoo whoo.” Something was stuck and scraping inside as the drawer tried and tried to open. The DVD player and TV are about 8 feet from where the bird clock was. It took several pushes of the Eject button to finally get the tray to come out (still holding the Plein Air America disk I’d last been watching). I pushed Eject/Close a few more times and each time, before it opened it hooted several times. So that solves the problem of where the noise was coming from (though I much preferred a visiting owl or my father’s spirit). BUT WHY AT 4:00 AM EVERY DAY? Even though it was a programable player/recorder, there were no items set to record and the thing was turned OFF and there was nobody pushing the button on the remote. It was in the remote holder box and there was nobody else in the house and the cats were on my bed. So the 4:00 a.m. part is still a mystery. As the clock was your father’s, even if it was ‘haunted’ I would say it’s a positive rather than negative thing. What might the messge be?? That would be my take anyway. Very interesting! 😀 THis is a great story! I wonder if the owl is just nesting in your attic — have you had your roof checked? Well, I think it could be a real bird. Several months ago we had a new bird which called loudly for a few minutes at 5.ooam precisely. We never managed to identify it and it only lasted a few weeks. We also do not live in an owl area but once there was an owl sitting on our bin right near the front door so perhaps they do stray out of area. I think a ghost is the least likely explanation! A lovely post, anyway. Well, here’s what I think you ought to do: Get up at 4, say good morning to your Dad, and enjoy that quiet time with some artwork! Why fight it or chase him away? Or the owl (if it’s real)? Mercy, Jana — Iswear to heaven, you live a most unusual life!!! Could it be a dream? One of those really really vivid dreams that wake you up thinking it was real? And what is the implications of the book ‘I heard the owl call my name?” (http://en.wikipedia.org/wiki/I_Heard_the_Owl_Call_My_Name) ..?? Weird, cara, weird — but truly, I’ve had dreams (and sometimes waking) auditory sounds that have ‘warned’ me about my son — I followed them — and found him in trouble each and every time. With your wonderful propensity for recording and illustrating your dreams, could this be one of them? Keep us informed, Jana — I think you’ve got a good story/life here!! I’d get up at the next occasion and say, Hi, Dad, what do you want to tell me? Then see what comes. Is it a greeting, a feeling of his presence, a sense of something he would do or say. Was he an insomniac and was he often up at 4 am? Huh! I like the idea of a slumber party in the rooms where you hear the owl. Maybe there is one who visits you at night, but I wouldn’t want to face him alone. I think it must be a real owl. Maybe in your attic, like Linda suggested. Have you tried going outside to see if you hear it there? I like your sketch! This is a lovely story. And I think this is most definitely a real owl. 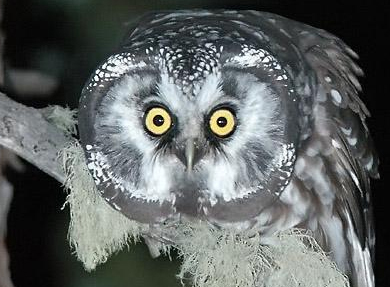 Owls often call in the wee hours – many times we have heard owls distantly calling before dawn. And know that owl calls can carry over a long, long distance, so you don’t have to have an owl-y spot right nearby in order to hear it. Consider yourself very lucky to have this owl friend out there! OK, weird, my in-laws have the SAME clock – and they are in Maine (dark thundering noise inserted here) And as spooky as this is – I think a sleep over with Lots of friends is the only way to get to the bottom of this -Perhaps a real owl??? but at 4am precisely every night?? Keep us posted. Glad to see your post. I’m with those who think there really IS an owl. they move and migrate (as do mocking birds who will sing before dawn, or near a street light, as apparently artificial light is good enough for potential swains to seduce their mates). Be glad it isn’t/wasn’t a bull frog. Trust me. Maybe because you are a tuned in sensitive person, you do hear things others do not. I’m for the practical answers though. However, the sight or sound of an owl in Fiji has a meaning – someone is pregnant but not telling! Hmmm. Stranger things happen. The “3” times sequence is a call for an awakening of some sort, or the announcement of it. There are only two possibilities. You are either in the presence of a real, persistent and hidden owl or a supernatural good thing. How can a real owl sing at the same time always? I don’t know much of birds either. I vote for the slumber party….but i have a friend who would swear that it is your dad….she has her grandparents who visit and madly rock in a chair…footsteps…up and down the steps…I have never heard them and I am NOT going to her house to see I mean hear! I once house-sat for a family whose grandfather had just died and whose remains were being taken back to Poland for burial. He lived in the house, in the room I slept in that summer. Anyhow, every night at around 2:30, the TV would turn on to “Walker, Texas Ranger.” After a few nights, we unplugged the TV, and sure enough, the next night-“Walker, Texas Ranger.” When we told his daughter, she said he often woke up late at night to write, and my roommate and I figured he must have still been in the house, and didn’t realize he was supposed to be travelling to Poland for the summer. Who knows, right? And I agree with the waking up early and working on some artwork. Now, my thoughts…you have an owl somewhere in the vicinity. Are you aware that owls have ventriloquial talents? That could account for the sound seeming to come from inside the house. Secondly, many of us believe owls to be “lucky.” Some writers get good mileage out of the opposite, but I favour owls as good guys!Well, all the ones I had dealings with were good. Thirdly, a slumber (or non-slumber) party sounds like a real “hoot.” If you invite me, I’ll wear my purple satin lounging ‘jamas! And a 4am start is not so bad so long as you remember to get your shut-eye at the end of the night!! What a hoot! Now all of us smarties who said it was a real owl can creep away and hide! Guessing now…maybe , when your computer does its late-at-night updating or running of anti-virus programmes, it triggers something that makes the dvd drawer (try to) open? And, yes, the ventriloquy thing is real. I’ve been fooled more than once by following calls to the wrong place! I’m packing some midnight snacks and my cat pajamas am am ready when you are. I love a good mystery! Keep us informed of all developments. Thanks everyone! Despite all the wonderfully creative ideas posed in the comments section, tonight I found the culprit! I pushed EJECT on the DVD player connected to my TV to insert the disk that came with a new, good book “Mastering Composition” by Ian Roberts. Instead of the drawer opening it began making that sound “whoop, whoo whoo; whoop, whoo whoo.” Something was stuck and scraping inside as the drawer tried and tried to open. Sorry about the bad link, Jana. I left out the “blogspot” part. I still think the slumber party/seance is crucial to the solution of your mystery. We’ll braid each other’s hair and then watch it all stand on end at 4 a.m.! I think I remeber hearing that clock in the backround as I was talking to our dad when he was still alive. We also live about two blocks from a freeway, and have sparrows, doves, squirrels and even a hawk that comes by every so often. Oh and possoms too. I wonder, even though you found out what was causing the problem, if there was a messege there from our dad! Had to laugh at your story because I have a related one. For about a year after moving into a new house, I kept finding an imprint of a circle on whatever I was wearing. Each day when I got up and put on a fresh t-shirt or other top there was no circle, but about every third day there was the circle imprint on my stomach by the time I went to bed. Sort of a rust colored mark, slightly shiny. I went all over the house pushing my stomach against things trying to find something circular that had made the imprint. No luck. Friends did the same, still no luck. Finally a friend brought over some sage and burned it, saying that my land was on an old Indian buriial ground and that I probably had a dead Indian haunting my house, and that the sage woiuld tell him I was a friendly inhabitant so as not to harm me. Well, about a year later, with me actually welcoming my circlular imprints, always saying a friendly “hi” to this Indian spirit, whenever I noticed them, I opened the door to a high cupboard one day to reach down a spray can of olive oil. It was shaped like a can of spray paint, and the top was hard to push down when I was finished with it, so I put the can against my stomach to push harder, and voila! I took the can away from my stomach and there was the “Indian”s mark! Never had thought to connect my occasional use of this olive oil can to my mysterious marks. My friends and I were actually sorry to hear I had solved the mystery, missing the presence of my “Indian spirit”. Just a slilghtly rusty-bottomed spray can. Darn! We’d be more than happy to investigate! hi i from india. i think u have to leave the watch near the grave of your father. If the wathch will not there will not any problem.